Animal Feed Enzymes Market size was worth over USD 1.1 billion in 2016 and will cross 80 kilotons by 2024. Increasing awareness about feed quality to improve animal health will drive the animal feed enzymes market growth. Viscosity reduction of non-starch polysaccharides fodder, improved digestion rate along with ability to withstand acidic pH conditions are the key properties supporting product demand. Indigestion due to lack of essential enzymes affecting the livestock health enhanced necessity for fodder additives. Inability to digest 15 to 25% of fodder among the pigs and poultry due to complex anti-nutritional factors present in the forage elements makes the product preferable among forage industry. Rising health consciousness along with growing population has enhanced the global meat consumption. As per Organization for Economic Cooperation and Development, globally average meat consumption per person is 75 pounds annually. Shifting consumer preference towards ready to eat processed meat products will facilitate product penetration. In terms of meat consumption, China consumes about 60 kg of meat per person annually and is anticipated to reach 85 kg by 2024. This will result in an upsurge in demand for high-quality meat and dairy products. Growing awareness concerning livestock diseases coupled with high acceptance of safe livestock nourishment practices will trigger industry growth. The industry expects highest gains from Asia Pacific. Rising population, upsurge in per capita consumption along with increasing consumer affordability are key factors driving regional industry growth. As per FAO, Asia Pacific dairy industry spending was over USD 100 billion in 2016 and it is predicted that milk production alone will reach to 120 million tons in the coming years. Fluctuating raw material prices due to dependency on seasonal crops will impact the animal feed enzymes market price trend. EU regulations pertaining to additives approval before being used as enzymes in fodder may lead to complex situations among the product manufacturers. Phytase animal feed enzymes market accounted for over 40% of the industry share in 2016. Improved metabolism and reproduction processes among livestock owing to its high phosphorus content will fuel product demand. Increasing non-starch polysaccharide (NSP) content in soybean, rice, and corn fodder has positively enhanced industry demand. Improving digestive system, lowers cholesterol levels and balances Ph levels among cattle & broiler will be key benefits stimulating product demand. The product also maintains the digestive tract and act as a binding agent for proteins present in the livestock. Protease generated over USD 150 million in revenue for 2016. Increasing peptide and amino acid supply to enhance performance among pig and poultry are the key properties supporting the product penetration. Improving fodder efficiency, minimizing cost, and upkeep of gut health are another key product properties. Dry formulation accounted for more than 75% of the global industry share in 2016. Easy handling, better thermal stability during food processing over liquid form makes the dry formulation preferable. Liquid formulation will generate more than 19 kilotons in volume by 2024. Large product availability at competitive price and increasing demand in areas where product can be obtained in liquid form easily will open new avenues for liquid animal feed enzymes market growth. Aquaculture animal feed enzymes market will witness over 7.5% CAGR up to 2024. Rising awareness related to protein and other nutrients available in fish will enhance industry growth in this segment. Europe dominates the overall aquaculture segment due to increased fishing activities in ponds, bivalve culture and cages. Ruminants will be worth over USD 450 million by 2024. Positive results among ruminants in terms of better health and increased nutrients consumption is another factor to enhance product demand in this segment. Poultry generated over USD 500 million business in 2016. Growing meat and egg consumption due to increased consumer affordability are key factors enhancing industry growth. Swine are projected to escalate product demand at a notable growth over 6.5% through to 2024. The industry expects high demand from China, Thailand, and Indonesia owing to high pig meat consumption in the region. Europe, led by Spain animal feed enzymes market, is foreseen to witness a significant gain at over 6% up to 2024. Presence of large end-use market along with strong distribution channel network has driven the industry growth. Eastern European nations, driven by Russia is estimated to depict fastest growth and will surpass USD 160 million valuation by 2024, increased pork consumption and rising livestock production are key supporting factors. U.S. is among the major fodder additives consumer including vitamins, emulsifiers and ferments. 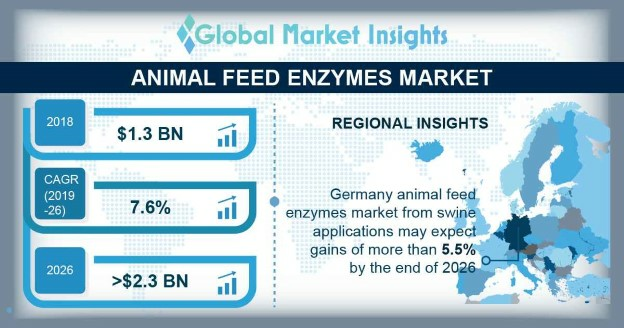 Strong presence of a deep-rooted livestock production along with strict food safety norms & regulations over the usage of supplements is driving the U.S. animal feed enzymes market demand. The clean label drift regarding additives and elements combined during the fodder processing will surge the product demand in the region. For instance, Advanced Enzymes Technologies delivers a widespread product portfolio of carbohydrase and proteases under the brand name, DigeGrain. APAC, dominated by China, India and Japan generated over USD 220 million in 2016. 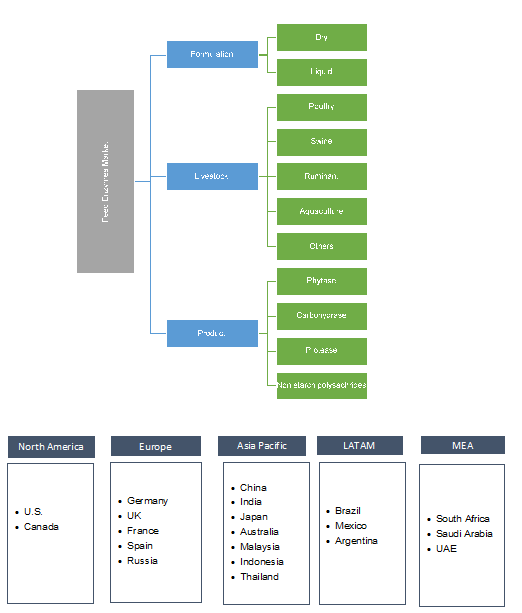 Key socio-economic factors, rising meat consumption particularly in China, India and rest of Southeast Asian countries are the factors positively influencing the animal feed enzymes market share. As per recent statistics, the average Japanese person consumes 50 kg of meat per year. Animal feed enzymes market share is highly competitive in nature due to the presence of numerous local manufacturers. Key industry participants include BASF, Duo Point, Chr Hansen Holding A/S, DSM N.V., Foodchem International, Novozymes, ENMEX, Flavorchem Corporation, DD Williamson & Co., BioExtract and Nutralliance. Companies are focusing on strengthening their existence in the animal feed enzymes market by implementing several growth strategies comprising new product innovation, research & development, expansion of production capacity, mergers, joint ventures and acquisitions. For instance, in January 2016, BASF introduced a new product named, Natuphos E, in India to provide more options to the end user of the country’s livestock fodder sector. Other notable manufacturers are Allied Biotech, Zhejiang NHU Co., RohaDyechem, Dynadis SARL, Divis Laboratories, LycoRed and Zmc-Usa. Implementation of innovative husbandry practices, industrialization of meat industry and growing awareness about quality of dairy products consumed will propel industry growth. These are added by farmers in the fodder to maintain appropriate nutrient level in the meals. Globally, around 70% of poultry and pig fodder is totally corn based and majority of it includes barley and wheat which are based on carbohydrase products. The product is regulated by the U.S. FDA and the EU for their use in different applications. This would further affect industry growth.